Hello, I am Chief Cory McMullan of the Belleville Police Service. 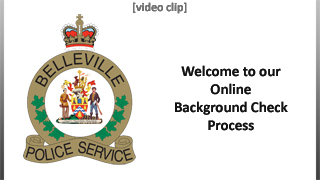 Welcome to our online background check process, where you can complete a police screening check from the comfort of your home, 24 hours a day - 7 days a week. There's no need now to take time off work, drive to our local police station, and wait in our lobby, when you can do it from the comfort of your home. On our website you'll find information on all three levels of police screening checks available to you. Authentication is performed by our partners, Forrest Green/TransUnion who are licensed consumer credit reporting agencies.